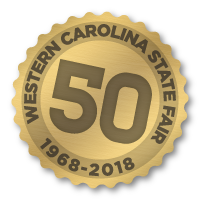 Outside and inside spaces will be available for the Western Carolina State Fair on a FIRST-COME, FIRST-SERVE BASIS. Join us for one of the fastest growing fairs in the south. There will be National entertainment, demolition derby and much more. The Exhibit Hall has indoor air conditioning and heating. Cost to vend is $225 per 8′ x 10′ booth (electricity can be provided at most booths). Insurance is $90 for the first booth and $70 for additional booths. If you do not purchase insurance, you must provide a certificate of liability insurance for $1 Million with WCSFF listed as the certificate holder. Tables and chairs available at additional cost. For more information, contact Tony Rickard.